Shashi is a Chartered Health Psychologist and Senior Lecturer in Health Psychology / Health Services Research at the School of Health Sciences, City University London. Shashi obtained his BSc (Hons) Degree in Psychology at City University London and then went on to complete his MSc and PhD degrees in Health Psychology at University College London, where he was Lecturer in Research Methods and Statistics on the MSc in Voice Pathology and Programme Director for the MSc in Health Psychology. He returned to City University London in October 2010 and is a senior member of the Health Services Research Group, teaches Research Methods and Applied Data Analyses on Postgraduate Courses (inc. MSc / MRes in Health Services Research and the MRes in Clinical Research) and sits on a number of research committees. 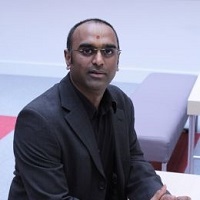 Shashi's research interests include the use of assistive technologies in health and social care, the application of health psychology in voice pathology and the design, delivery and evaluation of self-management/behaviour change interventions in chronic health conditions. Patel, R., Pereira, C., Dar, O., Banner, N., Simon, A. and Hirani, S. (2018). Exploring the Relationship Between BMI and Obesogenic Factors Including Nutritional Knowledge, Intake, Psychological Behaviours, Physical Activity and Quality of Life in a Post Heart Transplant Population: A Cross Sectional Study. Northcott, S., Thomas, S., Simpson, A., Burns, K., Hirani, S.P., Moss, B. … Hilari, K. (2018). How acceptable is solution focused brief therapy (SFBT) to people with severe aphasia? Piggin, L., Dwek, M.-.R., Propper, D., Machesney, M., Rixon, L., Newman, S. … Hurt, C. (2017). Perceived cognitive impairment and quality of life during adjuvant chemotherapy for colorectal cancer: a preliminary report from a longitudinal study. Whitelaw, P., Mulligan, K., Wedderburn, L.R., Hirani, S. and Newman, S. (2017). EVALUATION OF A WEBSITE FOR PARENTS OF CHILDREN WITH JUVENILE IDIOPATHIC ARTHRITIS (JIA) - WEBPARC. Piggin, L., Dwek, M.-.R., Machesney, M., Propper, D., Rixon, L., Newman, S. … Hurt, C. (2016). Chemotherapy-related cognitive impairment in adults with colorectal cancer: preliminary data exploring perceived impairment in relation to fatigue, anxiety, and low mood. Wong, S., Hirani, S.P., Charlton, D., Taylor, C., McKeown, E. and Saif, M. (2015). PWE-420 An international multi-centre survey to assess resources allocation and nutritional practices in spinal cord injury centres. Wong, S., Gainullina, I., Graham, A., Hirani, S.P. and Forbes, A. (2014). High prevalence of vitamin D deficiency in patients with spinal cord injury: a 1 year longitudinal study. Hirani, S., Rixon, L., Cartwright, M., Beynon, M., Doll, H. and Newman, S. (2012). Exploring the impact of a Tele-health intervention on specific quality of life domains and psychological well-being in diabetic patients within the Whole Systems Demonstrator Questionnaire Study. Cartwright, M., Hirani, S., Rixon, L., Beynon, M., Doll, H. and Newman, S. (2012). The effect of Telehealth on disease-specific quality of life in patients with heart failure: the Whole Systems Demonstrator Telehealth Questionnaire Study. Rixon, L., Hirani, S.P., Cartwright, M., Beynon, M., Doll, H. and Newman, S.P. (2012). A pragmatic cluster randomised controlled trial of telehealth on disease specific quality of life in patients' with chronic obstructive pulmonary disease and their health-related quality of life and psychological distress over 1 year in the Whole System Demonstrator programme. Beynon, M., Hirani, S., Cartwright, M., Rixon, L., Doll, H., Henderson, C. … Newman, S. (2012). The impact on carers of individuals with social care needs: the Whole Systems Demonstrator study. Cobb, J., Hinks, A., Flynn, E., Hirani, S., Patrick, F., Kassoumeri, L. … Wedderburn, L. (2012). GENOME-WIDE ASSOCIATION STUDY OF METHOTREXATE RESPONSE IDENTIFIES NOVEL GENES IN A LARGE COHORT OF EUROPEAN JUVENILE IDIOPATHIC ARTHRITIS CASES. Wong, S.S., Graham, A., Green, D., Hirani, S.P., Grimble, G. and Forbes, A. (2011). Meal provision in a UK National Spinal Injury Centre – a qualitative audit of service users and stakeholders. Wong, S.S., Derry, F., Jamous, A., Hirani, S.P., Grimble, G. and Forbes, A. (2011). A three-stage evaluation of the Spinal Nutrition Screening Tool (SNST) in patients with Spinal Cord Injuries (SCI) – results from a UK multicentre validation study. Buerkle, K.S., Mulligan, K., Hirani, S., Kassoumeri, L., Etheridge, A., Wedderburn, L. … Newman, S. (2011). THE IMPACT OF RESPONSE TO MTX ON THE ILLNESS AND TREATMENT BELIEFS OF PARENTS OF CHILDREN WITH JIA. Cleanthous, S., Cooke, D., Hirani, S., Kirk, A., Isenberg, D. and Newman, S. (2009). SYSTEMIC LUPUS ERYTHEMATOSUS: CONCORDANCE AND ACCURACY OF PATIENT AND PHYSICIAN EXPECTATIONS OF PHYSICAL FUNCTIONING. McGown, A.D., Harrington, J., Makker, H.K., Stygall, J., Hirani, S., Harrison, M. … Newman, S. (2004). Relationship between REM event rates, REM cerebral oxygenation, and CPAP compliance in consecutive subjects with obstructive sleep apnoea. Evans, J.C., Hirani, S.P. and Needle, J.J. (2019). Nutritional and Post-Transplantation Outcomes of Enteral versus Parenteral Nutrition in Pediatric Hematopoietic Stem Cell Transplantation: A Systematic Review of Randomized and Nonrandomized Studies. Biology of Blood and Marrow Transplantation. doi:10.1016/j.bbmt.2019.02.023 . Evans, J., Needle, J.J. and Hirani, S.P. (2019). Early outcomes of gastrostomy feeding in paediatric allogenic bone marrow transplantation: A retrospective cohort study. Clinical Nutrition ESPEN. doi:10.1016/j.clnesp.2019.02.014 . Northcott, S., Hirani, S.P. and Hilari, K. (2018). A Typology to Explain Changing Social Networks Post Stroke. Gerontologist, 58(3), pp. 500–511. doi:10.1093/geront/gnx011 . Wong, S., Santullo, P., Hirani, S.P., Kumar, N., Chowdhury, J.R., García-Forcada, A. … Saif, M. (2017). Use of antibiotics and the prevalence of antibiotic-associated diarrhoea in patients with spinal cord injuries: an international, multi-centre study. J Hosp Infect, 97(2), pp. 146–152. doi:10.1016/j.jhin.2017.06.019 . Hirani, S.P., Rixon, L., Cartwright, M., Beynon, M. and Newman, S.P. (2017). The Effect of Telehealth on Quality of Life and Psychological Outcomes Over a 12-Month Period in a Diabetes Cohort Within the Whole Systems Demonstrator Cluster Randomized Trial. JMIR Diabetes, 2(2). doi:10.2196/diabetes.7128 . Rixon, L., Hirani, S.P., Cartwright, M., Beynon, M., Doll, H., Steventon, A. … Newman, S.P. (2017). A RCT of telehealth for COPD patient's quality of life: the whole system demonstrator evaluation. Clinical Respiratory Journal, 11(4), pp. 459–469. doi:10.1111/crj.12359 . Tyagi, M., Fteropoulli, T., Hurt, C.S., Hirani, S.P., Rixon, L., Davies, A. … Newman, S.P. (2017). Cognitive dysfunction in adult CHD with different structural complexity. Cardiology in the Young, 27(5), pp. 851–859. doi:10.1017/S1047951116001396 . Baron, J.S., Hirani, S.P. and Newman, S.P. (2017). Investigating the behavioural effects of a mobile-phone based home telehealth intervention in people with insulin-requiring diabetes: Results of a randomized controlled trial with patient interviews. Journal of Telemedicine and Telecare, 23(5), pp. 503–512. doi:10.1177/1357633X16655911 . Diab, M., Bilkhu, R., Soppa, G., McGale, N., Hirani, S.P., Newman, S.P. … Jahangiri, M. (2017). Quality of Life in Relation to Length of Intensive Care Unit Stay After Cardiac Surgery. Journal of Cardiothoracic and Vascular Anesthesia, 31(3), pp. 1080–1090. doi:10.1053/j.jvca.2016.06.025 . Wong, S., Santullo, P., O'driscoll, J., Jamous, A., Hirani, S.P. and Saif, M. (2017). Use of antibiotic and prevalence of antibiotic-associated diarrhoea in-patients with spinal cord injuries: A UK national spinal injury centre experience. Spinal Cord, 55(6), pp. 583–587. doi:10.1038/sc.2016.193 . Hirani, S.P., Rixon, L., Beynon, M., Cartwright, M., Cleanthous, S., Selva, A. … Newman, S.P. (2017). Quantifying beliefs regarding telehealth: Development of the Whole Systems Demonstrator Service User Technology Acceptability Questionnaire. Journal of Telemedicine and Telecare, 23(4), pp. 460–469. doi:10.1177/1357633X16649531 . Philippou, Y.A., Steggall, M.J., Treacy, C.L., Hirani, S., O'Driscoll, S.T., Bakker, C.J. … Dahm, P. (2016). Penile rehabilitation for post-prostatectomy erectile dysfunction. Cochrane Database of Systematic Reviews, 2016(11). doi:10.1002/14651858.CD012414 . Beaney, K.E., Ward, C.E., Bappa, D.A.S., McGale, N., Davies, A.K., Hirani, S.P. … Humphries, S.E. (2016). A 19-SNP coronary heart disease gene score profile in subjects with type 2 diabetes: The coronary heart disease risk in type 2 diabetes (CoRDia study) study baseline characteristics. Cardiovascular Diabetology, 15(1). doi:10.1186/s12933-016-0457-7 . Wickwar, S., McBain, H., Newman, S.P., Hirani, S.P., Hurt, C., Dunlop, N. … Ezra, D.G. (2016). Erratum to "Effectiveness and cost-effectiveness of a patient-initiated botulinum toxin treatment model for blepharospasm and hemifacial spasm compared to standard care: Study protocol for a randomised controlled trial" [Trials. 17, (2016), 129]. Trials, 17(1). doi:10.1186/s13063-016-1502-2 . Liapi, A., Hirani, S. and Rubin, J. (2016). Changes in nasal resonance following septoplasty in adults: Acoustic and perceptual characteristics. Logopedics Phoniatrics Vocology, 41(3), pp. 93–100. doi:10.3109/14015439.2015.1007160 . Baron, J., Hirani, S. and Newman, S. (2016). Challenges in Patient Recruitment, Implementation, and Fidelity in a Mobile Telehealth Study. Telemedicine and e-Health, 22(5), pp. 400–409. doi:10.1089/tmj.2015.0095 . Woolf, C., Caute, A., Haigh, Z., Galliers, J., Wilson, S., Kessie, A. … Marshall, J. (2016). A comparison of remote therapy, face to face therapy and an attention control intervention for people with aphasia: A quasi-randomised controlled feasibility study. Clinical Rehabilitation, 30(4), pp. 359–373. doi:10.1177/0269215515582074 . Wickwar, S., McBain, H., Newman, S.P., Hirani, S.P., Hurt, C., Dunlop, N. … Ezra, D.G. (2016). Effectiveness and cost-effectiveness of a patient-initiated botulinum toxin treatment model for blepharospasm and hemifacial spasm compared to standard care: Study protocol for a randomised controlled trial. Trials, 17(1). doi:10.1186/s13063-016-1263-y . Oliveira, G., Hirani, S.P., Epstein, R., Yazigi, L. and Behlau, M. (2016). Validation of the Brazilian Version of the Voice Disability Coping Questionnaire. Journal of Voice, 30(2), pp. 247–247. doi:10.1016/j.jvoice.2015.01.004 . Baron, J.S., Hirani, S. and Newman, S.P. (2016). A randomised, controlled trial of the effects of a mobile telehealth intervention on clinical and patient-reported outcomes in people with poorly controlled diabetes. Journal of Telemedicine and Telecare, 23(2), pp. 207–216. doi:10.1177/1357633X16631628 . Davies, A.K., McGale, N., Humphries, S.E., Hirani, S.P., Beaney, K.E., Bappa, D.A.S. … Newman, S.P. (2015). Effectiveness of a self-management intervention with personalised genetic and lifestyle-related risk information on coronary heart disease and diabetes-related risk in type 2 diabetes (CoRDia): Study protocol for a randomised controlled trial. Trials, 16(1). doi:10.1186/s13063-015-1073-7 . Wickwar, S., McBain, H., Ezra, D.G., Hirani, S.P., Rose, G.E. and Newman, S.P. (2015). The psychosocial and clinical outcomes of orbital decompression surgery for thyroid eye disease and predictors of change in quality of life. Ophthalmology, 122(12), pp. 2568–2576. doi:10.1016/j.ophtha.2015.08.030 . Wong, S., Graham, A., Hirani, S.P., Charlton, D., Coalwood, S., McKeown, E. … Saif, M. (2015). Review of dietetic service provision and activity in spinal cord injury centres: A multicentre survey in the UK and Republic of Ireland. Spinal Cord, 53(12), pp. 855–859. doi:10.1038/sc.2015.83 . Wong, S., Graham, A., Hirani, S.P., Charlton, D., Coalwood, S., McKeown, E. … Saif, M. (2015). Erratum: Review of dietetic service provision and activity in spinal cord injury centres: A multicentre survey in the UK and Republic of Ireland (Spinal Cord (2015) 53, (901) doi:10.1038/sc.2015.202. Spinal Cord, 53(12), p. 901. doi:10.1038/sc.2015.202 . Wong, S., Jamous, A., O'Driscoll, J., Sekhar, R., Saif, M., O'Driscoll, S. … Hirani, S.P. (2015). Effectiveness of probiotic in preventing and treating antibiotic-associated diarrhoea and/or Clostridium difficile-associated diarrhoea in patients with spinal cord injury: A protocol of systematic review of randomised controlled trials. Systematic Reviews, 4(1). doi:10.1186/s13643-015-0159-3 . Wickwar, S., Mcbain, H.B., Ezra, D.G., Hirani, S.P., Rose, G.E. and Newman, S.P. (2015). Which factors are associated with quality of life in patients with Graves' orbitopathy presenting for orbital decompression surgery? Eye (Basingstoke), 29(7), pp. 951–957. doi:10.1038/eye.2015.76 . Wong, S., Saif, M., O'Driscoll, J., Kumar, N., Smith, E., Roels, E. … Jamous, A. (2015). Use of probiotics in preventing antibiotic associated diarrhoea and Clostridium difficile associated diarrhoea in spinal injury centres: An international survey of four western European countries. International Journal of Probiotics & Prebiotics, 10(2/3), pp. 85–90. Wong, S., Graham, A., Hirani, S.P., Charlton, D., Coalwood, S., McKeown, E. … Saif, M. (2015). Review of dietetic service provision and activity in spinal cord injury centres: a multicentre survey in the UK and Republic of Ireland. Spinal Cord. doi:10.1038/sc.2015.83 . Wong, S., Saif, M., O’Driscoll, J., Kumar, N., Smith, É., Roels, E. … Jamous, A. (2015). Use of probiotics in preventing antibiotic associated diarrhoea and clostridium difficile associated diarrhoea in spinal injury centres: An international multicentre survey. International Journal of Probiotics and Prebiotics, 10(2-3), pp. 85–90. Baron, J., Hirani, S. and Newman, S. (2015). A Mobile Telehealth Intervention for Adults With Insulin-Requiring Diabetes: Early Results of a Mixed-Methods Randomized Controlled Trial. JMIR Research Protocols, 4(1). doi:10.2196/resprot.4035 . Wong, S., Van Middendorp, J., Belci, M., Van Nes, I., Roels, E., Smith, … Forbes, A. (2015). Knowledge, attitudes and practices of medical staff towards obesity management in patients with spinal cord injuries: An international survey of four western European countries. Spinal Cord, 53(1), pp. 24–31. doi:10.1038/sc.2014.168 . Henderson, C., Knapp, M., Fernandez, J.-.L., Beecham, J., Hirani, S.P., Beynon, M. … Newman, S.P. (2014). Cost-effectiveness of telecare for people with social care needs: the Whole Systems Demonstrator cluster randomised trial. AGE AND AGEING, 43(6), pp. 794–800. doi:10.1093/ageing/afu067 . McBain, H., Shipley, M., Olaleye, A., Moore, S., Hirani, S. and Newman, S. (2014). The Development and Evaluation of a Self-Monitoring and Patient-Initiated Follow-up Service for People with Rheumatoid or Psoriatic Arthritis on Methotrexate. ARTHRITIS & RHEUMATOLOGY, 66. Wong, S., van Middendorp, J., Belci, M., van Nes, I., Roels, E., Smith, É. … Forbes, A. (2014). Knowledge, attitudes and practices of medical staff towards obesity management in patients with spinal cord injuries: an International survey of four western European countries. Spinal Cord. doi:10.1038/sc.2014.168 . Wickwar, S., McBain, H.B., Ezra, D.G., Hirani, S.P., Rose, G.E. and Newman, S.P. (2014). What are the psychosocial outcomes of treatment for thyroid eye disease? A systematic review. Thyroid, 24(9), pp. 1407–1418. doi:10.1089/thy.2014.0037 . Hirani, S.P., Beynon, M., Cartwright, M., Rixon, L., Doll, H., Henderson, C. … Newman, S.P. (2014). The effect of telecare on the quality of life and psychological well-being of elderly recipients of social care over a 12-month period: the Whole Systems Demonstrator cluster randomised trial. Age Ageing, 43(3), pp. 334–341. doi:10.1093/ageing/aft185 . McBain, H., Shipley, M., Moore, S., Olaleye, A., Hirani, S. and Newman, S.P. (2014). 58. A Self-Monitoring and Patient-Initiated Follow-Up Service for Patients with Rheumatoid or Psoriatic Arthritis: A Randomized Controlled Trial. Rheumatology, 53(suppl_1). doi:10.1093/rheumatology/keu098.013 . McBain, H., Shipley, M., Moore, S., Olayeye, A., Hirani, S. and Newman, S.P. (2014). 170. Self-Monitoring and Patient-Initiated Services in Rheumatology: The Views of Patients and Healthcare Professionals. Rheumatology, 53(suppl_1). doi:10.1093/rheumatology/keu107.001 . Wong, S., Jamous, A., O'Driscoll, J., Sekhar, R., Weldon, M., Yau, C.Y. … Forbes, A. (2014). A Lactobacillus casei Shirota probiotic drink reduces antibiotic-associated diarrhoea in patients with spinal cord injuries: a randomised controlled trial. Br J Nutr, 111(4), pp. 672–678. doi:10.1017/S0007114513002973 . Wong, S., Derry, F., Jamous, A., Hirani, S.P. and Forbes, A. (2014). Is undernutrition risk associated with an adverse clinical outcome in spinal cord-injured patients admitted to a spinal centre? Eur J Clin Nutr, 68(1), pp. 125–130. doi:10.1038/ejcn.2013.238 . Wong, S., Derry, F., Jamous, A., Hirani, S.P. and Forbes, A. (2014). Is undernutrition risk associated with an adverse clinical outcome in spinal cord-injured patients admitted to a spinal centre. European Journal of Clinical Nutrition, 68(1), pp. 125–130. doi:10.1038/ejcn.2013.238 . Cobb, J., Cule, E., Moncrieffe, H., Hinks, A., Ursu, S., Patrick, F. … Thomson, W. (2014). Genome-wide data reveal novel genes for methotrexate response in a large cohort of juvenile idiopathic arthritis cases. Pharmacogenomics Journal, 14(4), pp. 356–364. Cobb, J., Cule, E., Moncrieffe, H., Hinks, A., Ursu, S., Patrick, F. … Thomson, W. (2014). Genome-wide data reveal novel genes for methotrexate response in a large cohort of juvenile idiopathic arthritis cases. Pharmacogenomics Journal, 14(4), pp. 356–364. doi:10.1038/tpj.2014.3 . Rixon, L., Hirani, S.P., Cartwright, M., Beynon, M., Selva, A., Sanders, C. … Newman, S.P. (2013). What influences withdrawal because of rejection of telehealth - the whole systems demonstrator evaluation. Journal of Assistive Technologies, 7(4), pp. 219–227. doi:10.1108/JAT-06-2013-0017 . Wong, S., Graham, A., Green, D., Hirani, S.P. and Forbes, A. (2013). Nutritional supplement usage in patients admitted to a spinal cord injury center. J Spinal Cord Med, 36(6), pp. 645–651. doi:10.1179/2045772313Y.0000000105 . Steventon, A., Bardsley, M., Billings, J., Dixon, J., Doll, H., Beynon, M. … Newman, S. (2013). Effect of telecare on use of health and social care services: Findings from the Whole Systems Demonstrator cluster randomised trial. Age and Ageing, 42(4), pp. 501–508. doi:10.1093/ageing/aft008 . Beynon, M., Hirani, S.P., Cartwright, M., Rixon, L., Newman, S.P. and Investigators, W.S.D. (2013). Does carer quality of life benefit from care-recipients receiving telecare? A case-control prospective study. PSYCHOLOGY & HEALTH, 28, pp. 12–12. Wong, S., Graham, A., Hirani, S.P., Grimble, G. and Forbes, A. (2013). Validation of the Screening Tool for the Assessment of Malnutrition in Paediatrics (STAMP) in patients with spinal cord injuries (SCIs). Spinal Cord, 51(5), pp. 424–429. doi:10.1038/sc.2012.166 . Henderson, C., Knapp, M., Fernández, J.-.L., Beecham, J., Hirani, S.P., Cartwright, M. … Whole System Demonstrator evaluation team, (2013). Cost effectiveness of telehealth for patients with long term conditions (Whole Systems Demonstrator telehealth questionnaire study): nested economic evaluation in a pragmatic, cluster randomised controlled trial. BMJ, 346. doi:10.1136/bmj.f1035 . Wilson, M.H., Davagnanam, I., Holland, G., Dattani, R.S., Tamm, A., Hirani, S.P. … Birmingham Medical Research Expeditionary Society and Caudwell Xtreme Everest Research Group, (2013). Cerebral venous system and anatomical predisposition to high-altitude headache. Ann Neurol, 73(3), pp. 381–389. doi:10.1002/ana.23796 . Cartwright, M., Hirani, S.P., Rixon, L., Beynon, M., Doll, H., Bower, P. … Whole Systems Demonstrator Evaluation Team, (2013). Effect of telehealth on quality of life and psychological outcomes over 12 months (Whole Systems Demonstrator telehealth questionnaire study): nested study of patient reported outcomes in a pragmatic, cluster randomised controlled trial. BMJ, 346. doi:10.1136/bmj.f653 . Macdonald, I., Rubin, J.S., Blake, E., Hirani, S. and Epstein, R. (2012). An investigation of abdominal muscle recruitment for sustained phonation in 25 healthy singers. J Voice, 26(6), pp. 815–815. doi:10.1016/j.jvoice.2012.04.006 . Wong, S., Graham, A., Green, D., Hirani, S.P., Grimble, G. and Forbes, A. (2012). Meal provision in a UK National Spinal Injury Centre: a qualitative audit of service users and stakeholders. Spinal Cord, 50(10), pp. 772–777. doi:10.1038/sc.2012.43 . Wong, S., Derry, F., Jamous, A., Hirani, S.P., Grimble, G. and Forbes, A. (2012). The prevalence of malnutrition in spinal cord injuries patients: a UK multicentre study. Br J Nutr, 108(5), pp. 918–923. doi:10.1017/S0007114511006234 . Sanders, C., Rogers, A., Bowen, R., Bower, P., Hirani, S., Cartwright, M. … Newman, S.P. (2012). Exploring barriers to participation and adoption of telehealth and telecare within the Whole System Demonstrator trial: a qualitative study. BMC Health Serv Res, 12, p. 220. doi:10.1186/1472-6963-12-220 . Wong, S.S.H., Derry, F., Jamous, A., Harini, S., Grimble, G. and Forbes, A. (2012). IS NUTRITIONAL RISK ASSOCIATED WITH ADVERSE CLINICAL OUTCOMES SUCH AS LENGTH OF STAY AND MORTALITY IN SPINAL CORD INJURED PATIENTS ADMITTED TO A SPINAL CENTRE? GUT, 61. doi:10.1136/gutjnl-2012-302514b.39 . Steventon, A., Bardsley, M., Billings, J., Dixon, J., Doll, H., Hirani, S. … Whole System Demonstrator Evaluation Team, (2012). Effect of telehealth on use of secondary care and mortality: findings from the Whole System Demonstrator cluster randomised trial. BMJ, 344. doi:10.1136/bmj.e3874 . Wong, S., Derry, F., Jamous, A., Hirani, S.P., Grimble, G. and Forbes, A. (2012). Validation of the spinal nutrition screening tool (SNST) in patients with spinal cord injuries (SCI): Result from a multicentre study. European Journal of Clinical Nutrition, 66(3), pp. 382–387. doi:10.1038/ejcn.2011.209 . Oliveira, G., Hirani, S.P., Epstein, R., Yazigi, L. and Behlau, M. (2012). Coping strategies in voice disorders of a Brazilian population. J Voice, 26(2), pp. 205–213. doi:10.1016/j.jvoice.2010.10.023 . Wong, S., Derry, F., Jamous, A., Hirani, S.P., Grimble, G. and Forbes, A. (2012). Validation of the spinal nutrition screening tool (SNST) in patients with spinal cord injuries (SCI): result from a multicentre study. Eur J Clin Nutr, 66(3), pp. 382–387. doi:10.1038/ejcn.2011.209 . Wong, S., Graham, A., Harini, S.P., Grimble, G. and Forbes, A. (2012). Profile and prevalence of malnutrition in children with spinal cord injuries-assessment of the Screening Tool for Assessment of Malnutrition in Paediatrics (STAMP). SPINAL CORD, 50(1), pp. 67–71. doi:10.1038/sc.2011.139 . Henderson, C., Knapp, M., Fernandez, J.-.L., Beecham, J., Hirani, S., Beynon, M. … Doll, H. (2012). Cost-effectiveness of telehealth in people with social care needs: the Whole Systems Demonstrator cluster randomised trial. INTERNATIONAL JOURNAL OF INTEGRATED CARE, 12. Bower, P., Cartwright, M., Hirani, S.P., Barlow, J., Hendy, J., Knapp, M. … Newman, S. (2011). A comprehensive evaluation of the impact of telemonitoring in patients with long-term conditions and social care needs: Protocol for the whole systems demonstrator cluster randomised trial. BMC Health Services Research, 11. doi:10.1186/1472-6963-11-184 . Wilson, M.H., Edsell, M.E.G., Davagnanam, I., Hirani, S.P., Martin, D.S., Levett, D.Z.H. … Imray, C.H.E. (2011). Cerebral artery dilatation maintains cerebral oxygenation at extreme altitude and in acute hypoxia-an ultrasound and MRI study. Journal of Cerebral Blood Flow and Metabolism. Oliveira, G., Hirani, S., Epstein, R. and Behlau, B. (2011). Coping strategies in voice disorders of a Brazilian population. Journal of Voice. Epstein, R. and Hirani, S. (2011). Coping with Dysphonia - How Do They Do It? Perspectives on Voice and Voice Disorders, 21(1), pp. 24–30. Wong, S., Graham, A., Harini, S.P., Grimble, G. and Forbes, A. (2011). Profile and prevalence of malnutrition in children with spinal cord injuries-assessment of the Screening Tool for Assessment of Malnutrition in Paediatrics (STAMP). Spinal Cord. Timon, C.I., Hirani, S.P., Epstein, R. and Rafferty, M.A. (2010). Investigation of the impact of thyroid surgery on vocal tract steadiness. J Voice, 24(5), pp. 610–613. doi:10.1016/j.jvoice.2009.02.003 . Timon, C.I., Hirani, S.P., Epstein, R. and Rafferty, M.A. (2010). Investigation of the impact of thyroid surgery on vocal tract steadiness. Journal of Voice, 24(5), pp. 610–613. doi:10.1016/j.jvoice.2009.02.003 . Phillips, P.S., Hirani, S.P. and Epstein, R. (2009). Peak Flow and Voice Pathology. Journal of Voice, 23(5), pp. 521–528. doi:10.1016/j.jvoice.2008.01.006 . Upile, T., Jerjes, W., Kafas, P., Harini, S., Singh, S.U., Guyer, M. … Hopper, C. (2009). Salivary VEGF: A non-invasive angiogenic and lymphangiogenic proxy in head and neck cancer prognostication. International Archives of Medicine, 2(1). doi:10.1186/1755-7682-2-12 . Mathieson, L., Hirani, S.P., Epstein, R., Baken, R.J., Wood, G. and Rubin, J.S. (2009). Laryngeal Manual Therapy: A Preliminary Study to Examine its Treatment Effects in the Management of Muscle Tension Dysphonia. Journal of Voice, 23(3), pp. 353–366. doi:10.1016/j.jvoice.2007.10.002 . Epstein, R., Hirani, S.P., Stygall, J. and Newman, S.P. (2009). How Do Individuals Cope With Voice Disorders? Introducing the Voice Disability Coping Questionnaire. Journal of Voice, 23(2), pp. 209–217. doi:10.1016/j.jvoice.2007.09.001 . Hirani, S.P., Patterson, D.L.H. and Newman, S.P. (2008). What do coronary artery disease patients think about their treatments? : An assessment of patients' treatment representations. Journal of Health Psychology, 13(3), pp. 311–322. doi:10.1177/1359105307088133 . Newman, S., Stygall, J., Hirani, S., Shaefi, S. and Maze, M. (2007). Postoperative cognitive dysfunction after noncardiac surgery: a systematic review. Anesthesiology, 106(3), pp. 572–590. Hirani, S.P., Hyam, J.A., Shaefi, S., Walker, J.M., Walesby, R.K. and Newman, S.P. (2006). An examination of factors influencing the choice of therapy for patients with coronary artery disease. BMC Cardiovascular Disorders, 6. doi:10.1186/1471-2261-6-31 . Hirani, S.P., Pugsley, W.B. and Newman, S.P. (2006). Illness representations of coronary artery disease: An empirical examination of the Illness Perceptions Questionnaire (IPQ) in patients undergoing surgery, angioplasty and medication. British Journal of Health Psychology, 11(2), pp. 199–220. doi:10.1348/135910705X53443 . Hirani, S.P., Pugsley, W.B. and Newman, S.P. (2006). Illness representations of coronary artery disease: an empirical examination of the Illness Perceptions Questionnaire (IPQ) in patients undergoing surgery, angioplasty and medication. Br J Health Psychol, 11(Pt 2), pp. 199–220. doi:10.1348/135910705X53443 . Hirani, S.P. and Newman, S.P. (2005). Patients' beliefs about their cardiovascular disease. Heart, 91(9), pp. 1235–1239. doi:10.1136/hrt.2003.025262 . Hirani, S., Sanders, C., Bowen, R., Newman, S.P., Bower, P., Cartwright, M. … Rogers, A. Exploring reasons for non-participation and withdrawal from a randomised controlled trial of telehealth and telecare interventions in England: a qualitative study. British Medical Journal. Wickwar, S., McBain, H., Hirani, S., Hurt, C., Dunlop, N., Solly, D. … Ezra, D. Illness and treatment perceptions in adults with periocular facial dystonias. .
Lawes-Wickwar, S., McBain, H., Hirani, S., Hurt, C., Dunlop, N., Solly, D. … Ezra, D. What are the associations between demographic, clinical and psychosocial factors with quality of life in adults with blepharospasm and hemifacial spasm? . - APM017 Engaging Technology in health and social care: Telehealth, telecare and telemedicine.